My full day of activities at Daiju Elementary School in Yamagata City began with a welcome ceremony attended by all of the school's nearly 600 students. 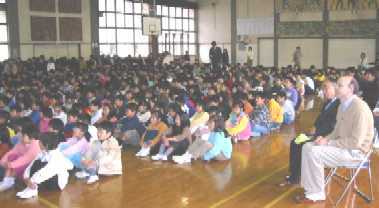 As I marched in with Mr. Nobutaka Takahashi, the school's principal, and Mr. Yuji Suzuki, a leader for many years of Yamagata City's activities related to the Blue-eyed Dolls, I was so surprised to hear the band loudly playing and the children enthusiastically singing a song of welcome. The highlight of the ceremony was an original play performed by one of the sixth-grade classes. The play's title was "Helen's Story - Toward a Peaceful Tomorrow." The drama put on by the sixth-grade class told the entire story of the Friendship Dolls from the beginning in 1926 to early 2001, when Daiju Elementary School received a new Friendship Doll named Helen from Mr. Sidney Gulick, 3d, and his wife. The play included two beautiful songs with the lyrics and music written by several talented sixth-grade students. The class had spent about a month writing the script and rehearsing, and the 35 students performing the play showed enthusiasm and also got the audience to laugh a few times, especially at some of the sound effects. The students watched intently and listened quietly during the 20 or 30 minutes of the play. I plan to translate the lyrics of the two original songs by the end of this year and publish them on the Friendship Dolls web site. I also hope to translate someday the script of the play into English. 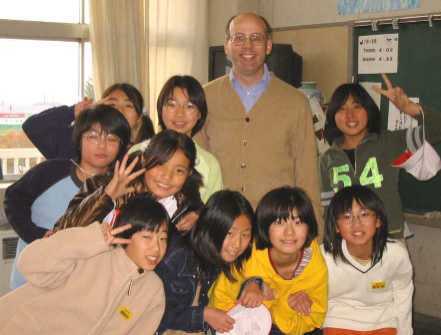 During the second and fourth class periods, I visited the sixth-grade classes to talk and to answer questions about the United States and the Friendship Dolls. The principal showed me the school and let me observe several of the classes during the third period. A couple of sixth-grade students had very difficult questions for me about terrorism and the war in Afghanistan. Since the original purpose of the Friendship Dolls in 1927 was to try to establish world peace through children, I felt quite uncomfortable explaining that I thought that the war in Afghanistan was necessary and that we may need to kill Osama Bin Laden and the other leaders of terrorism. I explained that the terrorist leaders are intent on killing Americans and their allies, so the only choice we had was to try to capture or kill them. When I asked one of the students about her thoughts on the war, she explained that it would be best to stop the war and resolve the situation in another way. I plan to write to the students in December to try to explain better my opinions regarding the war America is now fighting, and I also hope the students will send me their thoughts on how best we can approach the terrible situation that the world now faces in Afghanistan, the Middle East, and other places. After lunch and after the students finished cleaning the school, the older students spent the fifth class period in "Challenge Activities" of their own choosing. 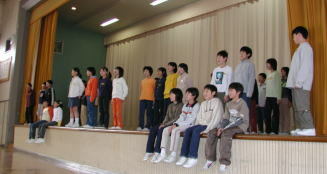 The school has about 15 different clubs, including drama, broadcasting, computer, English, and music. I spent a long time observing the activities of the sign language club, where the students practiced sign language with various skits and songs. I enjoyed most seeing them use sign language to the lyrics of one of my favorite Japanese songs, "Tomorrow" by Mayo Okamoto. The principal Mr. Takahashi gave me a beautiful book of photos of Yamagata Prefecture, which he had authored based on many years of taking photos throughout Yamagata. 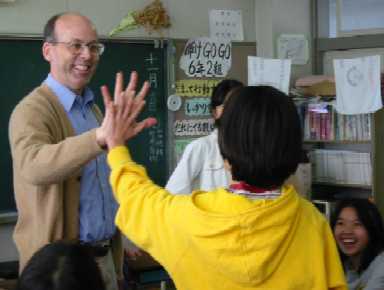 When we visited the school's library, he pointed out two other books of photos of Kenya and Turkey, which he had created when he worked at the Japanese schools in these countries. Even though Daiju Elementary School did not exist in 1927 when the original Friendship Dolls from America were distributed throughout Japan, the school's principal, teachers, and students showed great interest in studies and activities related to the original doll exchange. 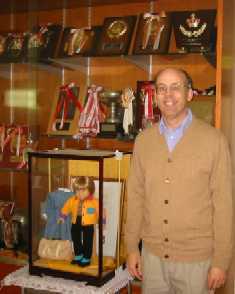 They proudly displayed their new doll Helen, received in March 2001, next to the school's trophy case outside the principal's office. 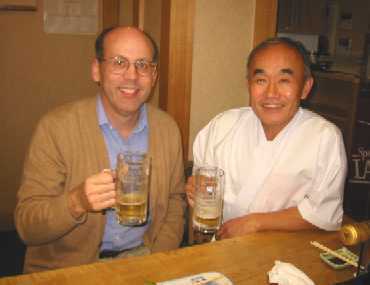 In the evening I went to the sushi shop owned and operated by Mr. Suzuki, who had been the other special guest at the morning's ceremony. The sushi and sashimi tasted quite delicious. Although it seemed quite busy on this Friday night, we talked together for a couple of hours about many things, including his involvement with the Blue-eyed Dolls from America. He served as chairman of the PTA of Yamagata City Daiichi Elementary School and as chairman of the Blue-eyed Doll Festival Committee. 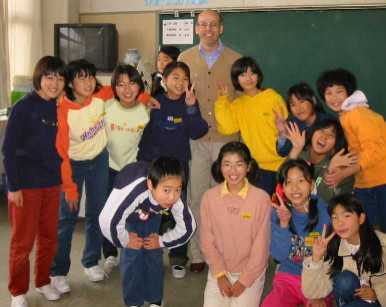 Between 1989 and 1992 the Committee coordinated many activities in Yamagata City related to the Blue-eyed Dolls. I met his son working at the sushi shop, who is the third generation in the business. Mr. Suzuki gave me a copy of Eiko Takeda's children's book entitled Friendship Dolls Across the Ocean (1997). This book, which explains the Friendship Doll story in simple language for children, turned out to be quite helpful on my visits to other Japanese schools in the following two weeks.